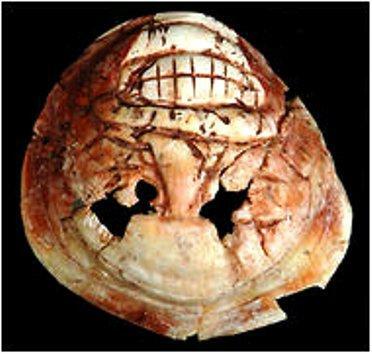 Takeshi Inomata - Carved shell representing a decapitated head from around 600 B.C. Since 2006 Daniela has been tackling a giant jigsaw puzzle, spending many days examining hundreds of pieces of stucco fragments. These pieces once adorned the facade of an East Court palace building that was probably occupied by the ruler of Ceibal in the last days of this city. As the structure collapsed, the stucco sculptures broke into small pieces. While still fragmentary, important insights have gradually emerged. Takeshi Inomata - Stucco sculpture of a human figure missing its head from around A.D. 900. 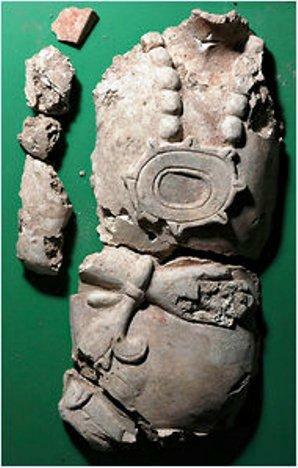 There was a theory that Ceibal was invaded by non-Maya groups in the social upheaval at the end of the Classic period. But in the sculptures there is nothing that suggests the foreign identity of the palace residents. 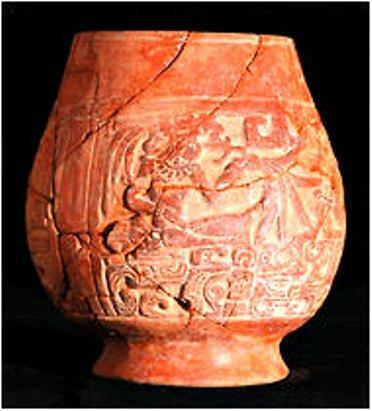 Most likely the last rulers of Ceibal were culturally lowland Maya, although they certainly had trade and contacts with outside groups. Dani also confirmed that the human figures in these stucco friezes were all missing their heads. They were almost certainly removed intentionally. The end of Ceibal was not gradual. The fall of the Ceibal dynasty was marked by the destruction of its palace. Such is the nature of archaeological research. Important information emerges through long, tedious lab work. As glamorous and exciting as fieldwork may seem, it is just the beginning of our work. For every two to three months in the field we spend six to 12 months analyzing the excavated materials. That is just for the basic analysis and does not include more technologically sophisticated analyses, like radiocarbon dating and elemental analysis on ceramics. And then, there will be publications. Takeshi Inomata - Carved ceramic vessel from around A.D. 830. Our careers, like those of all academics, depend on publications. But before that, lab analysis and the dissemination of information are our ethical responsibility. In contrast with experiments in the natural sciences, in archaeology we cannot excavate a particular spot twice. Once we excavate it, its contexts (how artifacts and other materials are found) are forever destroyed. That is why we need to process and document our finds properly and share the information with the academic community and the general public. It is not an easy task. Excitement and motivation are high during fieldwork, but they tend to wane during lab seasons. And funding for lab work is much harder to come by. However, the reputation of an archaeological project ultimately hinges on its lab work. If lab work goes well, publications follow smoothly. Ceramic analysis by Takeshi, Dani and many Guatemalan participants. Lithic analysis by Kazuo (University of Ibaraki, Japan). The study of the stucco sculptures by Dani. 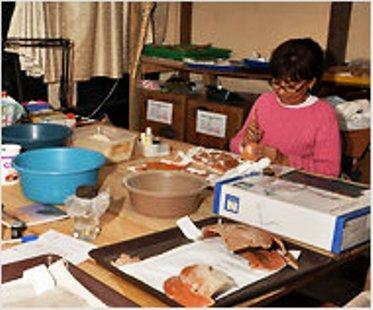 The analysis of figurines, stone ornaments and other artifacts by Dani and Takeshi. The study of glyphic inscriptions by Stephen Houston (Brown University). The analysis of human skeletal remains by Juan Manuel Palomo (University of Arizona) and Lori Wright (Texas A&M University). The analysis of faunal remains by Ashley Sharpe (University of Florida). The restoration and conservation of important objects by Dani and Estela Pinto. GIS (geographic information system) and remote sensing data analysis by Jessica Munson (University of Arizona). Artifact drawings by Alfred Román. Digitizing of field drawings by Guatemalan students. Compositional analysis of ceramics by Ronald Bishop (National Museum of Natural History, Smithsonian Institution) and Dani (to examine where they were made and how they were distributed). Lithic use-wear analysis by Kazuo (to identify how and on what materials stone tools were used). Isotope analysis of human bones by Lori Wright (to examine what the people ate and where they were born and grew up). Soil chemistry analysis by Richard Terry (Brigham Young University, to study human activity and agricultural practices). The analysis of lake sediments by Hitoshi Yonenobu (Naruto University of Education, Japan) and his collaborators. The analysis of carbonized plant remains by Hiroo Nasu (Graduate University for Advanced Studies, Japan). The microscopic analysis of stucco floors and other deposits by Jessica Munson and Jessica MacLellan (University of Arizona). Radiocarbon dating at the University of Arizona accelerator mass spectrometry lab and at other laboratories. Takeshi Inomata - Estela Pinto reconstructing a ceramic vessel in our lab house. A lot of our work during the field season is designed so that these subsequent complex processes in the lab go smoothly. We keep detailed records on excavation forms and artifact logs, which can be shared by the various specialists. We wash the excavated artifacts and do the preliminary sorting while we are in the field. Much of this work is coordinated by Estela Pinto, our longtime lab director. In addition to these lab tasks, Estela takes care of the logistics of the project, preparing the monthly payroll for more than 50 workers and 13 archaeologists, buying food and supplies and keeping account of hundreds of receipts. She manages all of this with admirable good cheer and competence, and somehow still manages to turn out perfectly styled every day. She is truly the heart and soul of the project. This is the last of our regular postings. We would like to thank readers for following this blog. When we leave the field at the end of March, we will write our final thoughts on this season’s work. In archaeological digs, the most important finds often happen in the last few days of the season, forcing us to work frantically for long hours. With excitement and some apprehension, let’s see what happens.